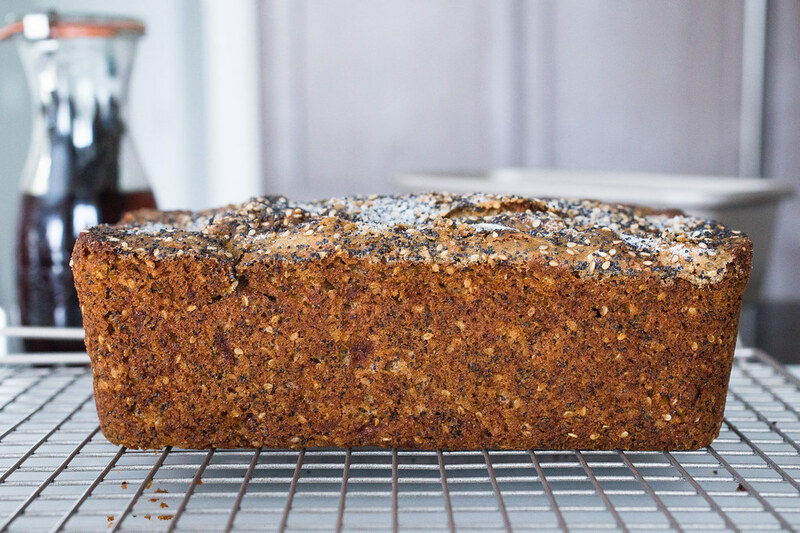 With its sugar-seeded crackly top, this seeded whole wheat banana bread is an unforgettable and unconventional recipe that you’ll keep forever in your recipe files. A couple of weeks ago, I asked myself a very serious question: Do I really need another banana bread recipe in my life? And of course the answer was a resounding YES. 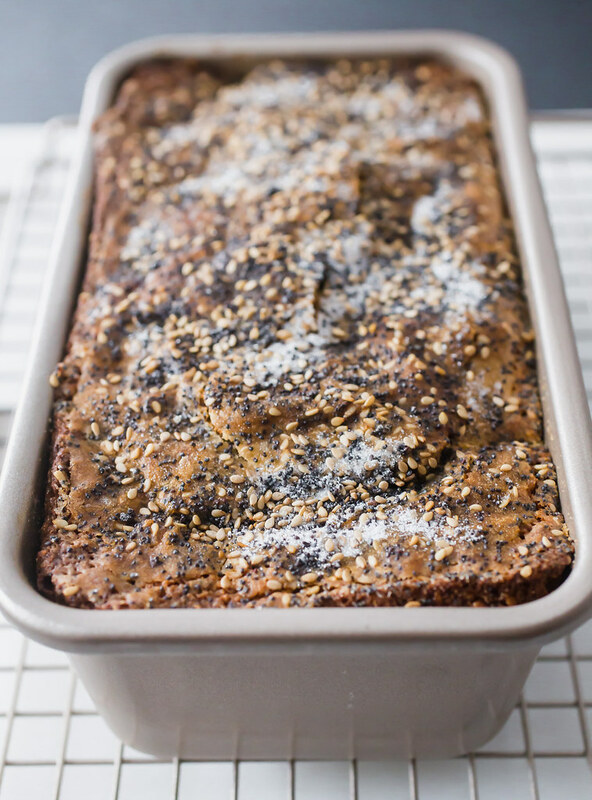 Because this seeded whole wheat banana bread is different from any I’ve tried before. For me, that’s saying a lot because we loooove banana bread around here! And since there seems to be a never ending supply of over-ripened bananas, some kind of banana bread is usually my go-to plan for using them up. My mom’s banana bread recipe was the only one I made for years, and it’s one I still love for a really simple and quick bread. Then I found the Cook’s Illustrated version where the bananas are heated leaving a concentrated banana liquid banana extract of sorts. It’s an effing fantastic recipe that for whatever reason, I never posted here. Next came what is surely the most decadent banana bread I’ve ever eaten: peanut butter cup hot fudge banana bread. Because: go big or go home, right? And then there was Sarah Kieffer’s recipe. And my goodness, that woman knows her banana bread! That one is probably the very best banana bread I’ve ever had (sorry, Mom!)! Someday there will be enough left for me to photograph and share with you all. I’m sure you weren’t expecting a history of my banana bread endeavors here but alas. 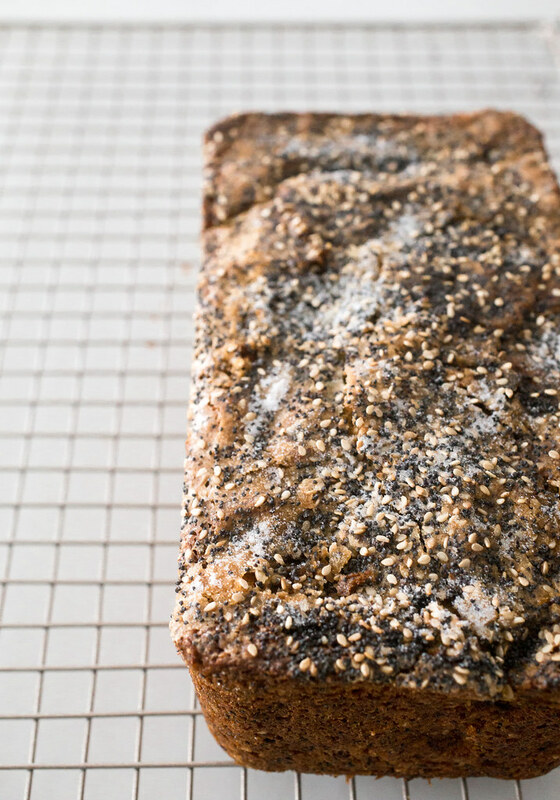 It’s all about the lead up to this seeded whole wheat banana bread recipe. This is one I approached with caution. 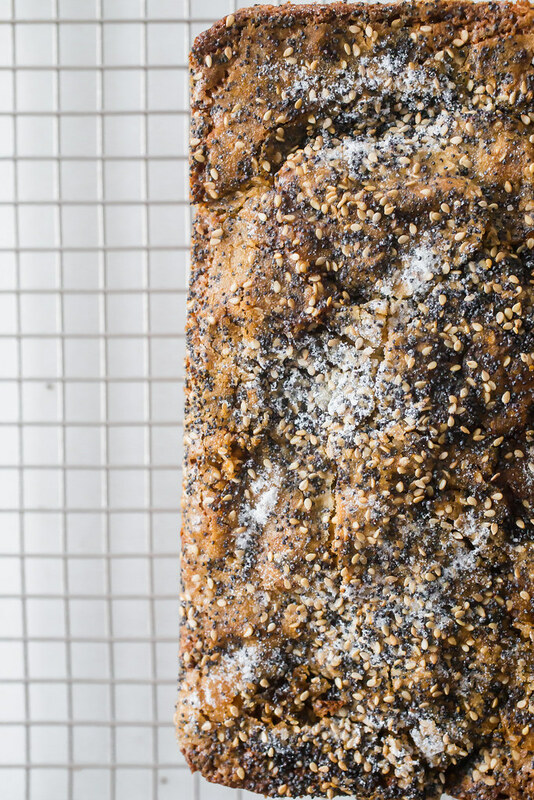 I mean, poppy and sesame seeds in banana bread?? For real? But what it came down was a super simple recipe that turned out so, so much better than I expected. All measured up with a new set of snazzy stainless measuring spoons and cups – my old ones were pre-wedding age (11yrs!) – I poured the speckled batter out into a greased and floured golden non-stick loaf pan. Then I jazzed up the top of the batter with more seeds! Who am I?! 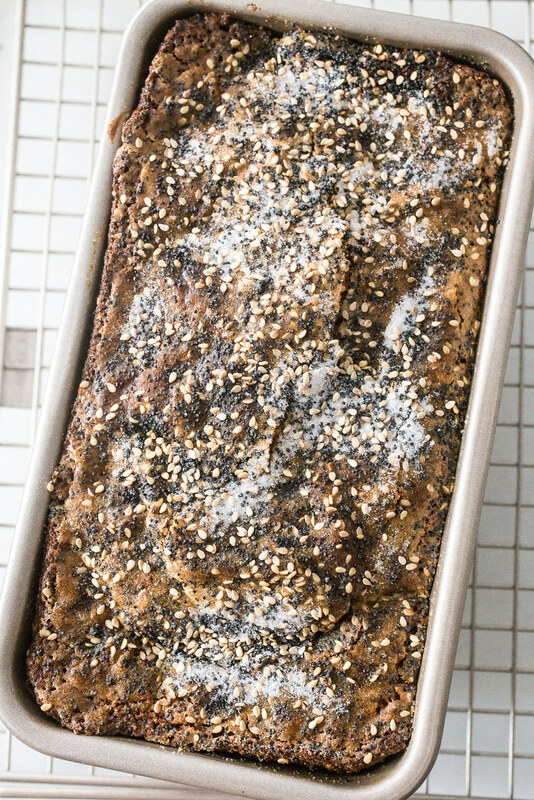 About an hour later, I slipped this seeded whole wheat banana breadfrom the pan onto my cooling rack. I flipped that rack upside-down to prevent the bread from slipping off while moving around the kitchen for photos. 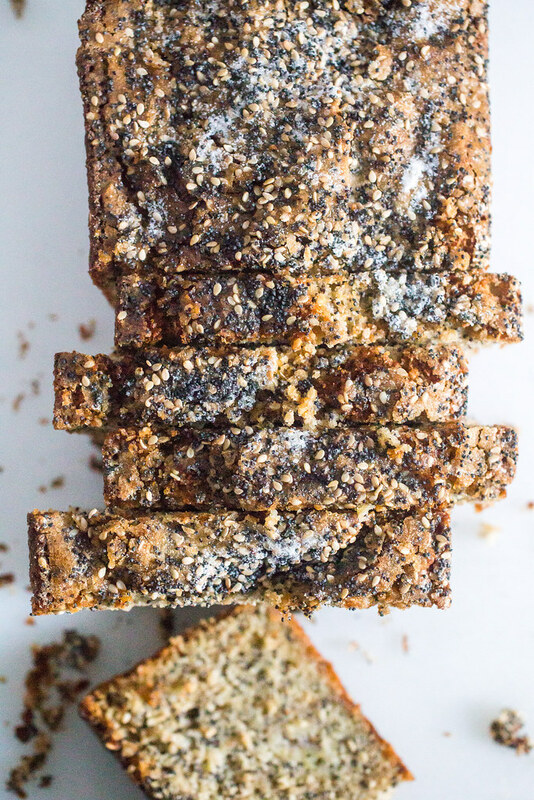 I seriously can’t say enough good things about this banana bread. The combination of the seeds and whole wheat flour gave the bread a lovely nutty flavor, a flavor I loooove but love only without the actual nuts. So yeah, I skipped the nuts the recipe called for but feel free to add them in if it’s your thing. Before I leave you with this recipe, I need to call attention to the top of this banana bread. 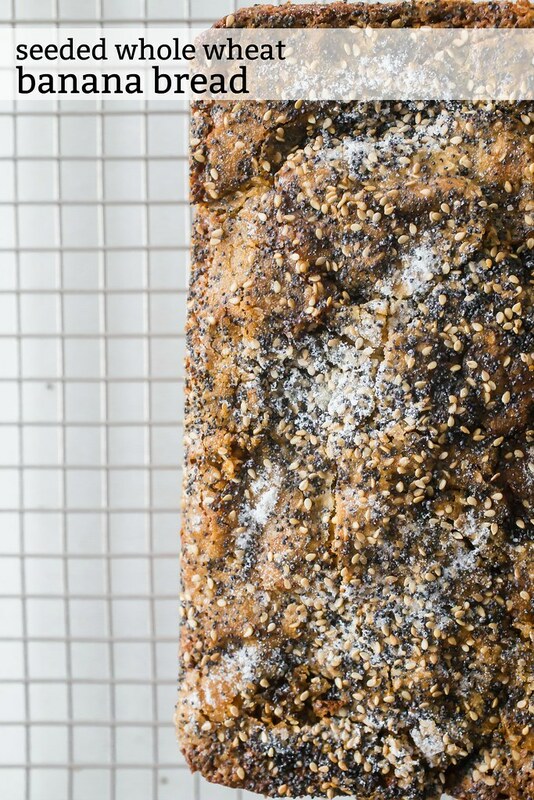 The sprinkle of sugar with the poppy and sesame seeds creates this insanely addictive and gorgeously crackly top. If I were a lesser woman, I may have picked the edges off right after these photos were taken. 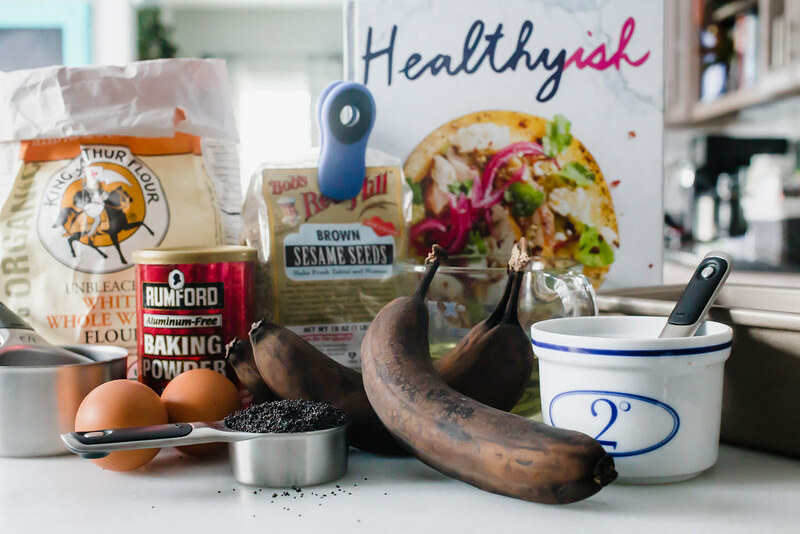 As part of the OXO Blogger Outreach program, I was provided with Lindsay Maitland Hunt’s Healthyish book and some of the tools needed to make this recipe. Thank you for supporting the brands that support me and this blog. Using frozen bananas would work great for this banana bread but plan ahead. You’ll need to thaw and drain off the banana liquid before adding the mashed bananas to the batter. If you don’t drain the liquid, the center of your bread won’t rise properly and you may end up with an underdone center and overly brown top. The ONLY thing I would change about this recipe the next time I make it is to add a little orange zest to the batter. Each bite left me needing just a little boost of brightness that only citrus can bring. I’ve included this in the recipe below as an optional ingredient but I urge you to include it. Preheat oven to 350° F. Grease and flour an 8×4-inch loaf pan. In a small bowl, mix 1 tablespoon sugar, 2 teaspoons poppy seeds, and 2 teaspoons sesame seeds together and set aside. In a large mixing bowl, whisk the flour, remainder of the sugar, poppy seeds, and sesame seeds, baking powder, and salt together. In a smaller mixing bowl whisk the oil, mashed banana, eggs, vanilla extract, and orange zest (if using) together until well-combined. Pour the wet ingredients into the dry ingredient and with a rubber spatula, fold the wet into the dry until just combined and no streaks of flour remain. Fold in the nuts, if using. Transfer the batter to the prepared load pan and smooth out the top. Sprinkle the reserved sugar-seed combination evenly over the top of the batter. Bake for 55 to 60 minutes, until the top is toasty brown and a toothpick inserted into the center of the bread comes out clean. Transfer the pan to a wire cooling rack and cool for 15 minutes. Over a large plate, carefully invert the pan to release the banana bread – some of the seeds from the top will spill out but the plate will help avoid a mess. Allow the bread to cool on the rack completely before slicing and serving. Wrapped well in plastic wrap, the banana bread will keep nicely at room temperature for 3-4 days. I’m making this recipe for the first time, but confused about when to add the 1/2 cup oil. I suppose it goes with the wet ingredients. Am I missing something? Hi Barbara! So sorry about this exclusion! The oil is whisked with the wet ingredients (banana, eggs, etc.). Thanks for catching this – I’ve just updated the recipe.